Loy Bonseak, from Cambodia, was 17 years old when he escaped from Pol Pot's army to live in a refugee camp on the Thai border in about 1982. 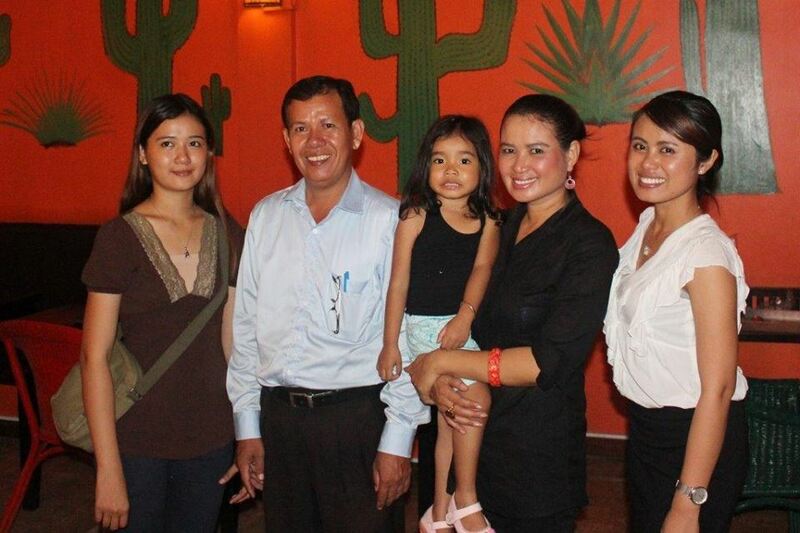 He didn't come back until Cambodia's genocide was over, a few years later. He married his wife when they were both teenagers in the refugee camp, and went to Siem Riep (where Angkor Wat is located) to put their lives together again. Pictured are his wife and three daughters now. The youngest child was adopted when they found her in an orphanage. In my recent travel to Cambodia, I was elated to find Loy who demonstrates a profound resilience--an ability to turn one's life around without bitterness. One Cambodian refugee told me when I asked him about his story when I was in a refugee camp in Thailand in the early 1980's, "It would take a river of ink to tell the sorrow of my people during the time of Pol Pot." Loy is a man, as you can see, who has worked to heal that chapter of his young life. What a delight it was to meet him! Since I was a small child, the power of storytelling has stretched my resilience, eased my fears, propelled me to have courage, and grown my compassion. I believe the power of a story, whether it is spun with written or oral words, is one of the most important tools in life. In my mind, library, heart, and files, I collect stories. I believe everyone has a story to unravel if we have the patience to listen for it. The stories that we keep in our reservoirs can illuminate and inspire us.. They can rescue us, healing and restoring broken hearts, in the most difficult of atrocities. When they are retold years later, the knowledge of these heroic acts of strength (of character) can shape us, giving us mettle when we hobble or ache. "As we stumbled on for miles, slipping on icy spots, supporting each other time and again, dragging one anther up and onward, nothing was said, we both knew: each of us was thinking of his wife. Occasionally I looked at the sky, where the stars were fading and the pink light of the morning was beginning to spread behind a dark bank of clouds. But my mind clung to my wife's image, imagining it with an uncanny acuteness. I hear her answering me, saw her smile, her frank and encouraging look. Real or not, her look was then more luminous than the sun which was beginning to rise." In the darkness of the walls of Auschwitz, Frankel told uplifting stories to his fellow prisoners. When he had the energy, he encouraged them to remember the stories of the people whom they loved. He told them to honor that person in their minds, and that a great flood of love would come to them. Through processing the memories of loved ones and their stories, the concentration camp victims could be elevated to another sphere. As bleak and dim as their external, physical lives were in Auschwitz, Frankel taught them how to live in their minds. He wrote that one could understand love in a new way, "The angels are lost in perpetual contemplation of an infinite glory." In my travels, I have met men and women of immense fortitude that have given me pause to rethink how I could handle my own difficulties. Some have experienced much tragedy, but they trudge on--loving, forgiving, persevering anyways. One trait that I have noticed about all of the people I have known that motivate me: they excavate, find ways within themselves to contribute to others, making the world a better place. Often times they document it for others that will follow them. Last June we spent the day with Geert Van Den Gogaert, from Gent, Belgium, owner of Normandy Heroes while we toured around Normandy, France. We were there to see the same places that my father-in-law, H. Smith Shumway had experienced when he landed on June 6, 1944 on Omaha Beach as a young 22 year old (Six weeks later he would be blinded in the push to Paris). I noticed immediately that Geert and I both are "tale seekers," trying to discover stores that have been preserved to illuminate history. On that special day of connecting stories to sacred places, we exclaimed how much stories affect our lives--especially from people who are humble, even obscure. Geert, a professional tour guide who speaks three languages said, "When I go into a town and walk on the streets of Normandy, I try to discover someone with gray hair to tell me about the French Resistance and wartimes. The more gray hair the better!" In the book, The Road to Character by David Brooks, he explores human character, as we juggle with the conflicts of trying to become successful in our careers and in developing traits that inspire us to be better people. He writes about the struggle we humans have between "resume virtues" and "eulogy virtues", qualities that will live on with us after we die. Brooks quotes Dave Jolly, a veterinarian, who sums up a thoughtful life: "The heart cannot be taught in a classroom intellectually, to students mechanically taking notes. . . . Good, wise hearts are obtained through lifetimes of diligent effort to dig deeply within and heal lifetimes of scars. . . . The job of a wise person is to swallow the frustrations and just go on setting an example of caring and digging and diligence in their own lives." "The quality of mercy is not strained. It droppeth as the gentle rain from heaven. It blesseth him that give and him that takes." I am a life-long "taker"--storing the stories when I am in a drought myself. The famous, renown people surely intrigue me, such as world leaders, generals, writers, humanitarians because I love history. But it is the ordinary person who has persisted, in spite of fears, war, and even genocide that move me to another level. I want to hear their voices too. Perhaps it is because the obscure and unknown voices are so often forgotten, off the grid or map. Yet they too show me that I can hold on; they buoy my faith and spirit. I believe every person has a story, an important tale to tell. In fact, they are the currency of the world. When we went to her house, it was very simple, clean, and beautiful. In the living room, there was a large picture of a 13 year old girl in the middle of the shelf. My friend told me that his 13 year old cousin was trying to save her grandmother's life when she was tragically killed. Her grandmother, Katavathadu's mother-in-law, had argued with her son the day before. The mother-in-law was so distraught or angry that she decided to jump in a deep well. When Katavathadu's daughter saw her grandmother trying to jump to her death, she beckoned for her to stop, pulling her away from the well. But her arm was caught, and both slipped to their deaths. Katavathhadu has one remaining daughter. The picture of this brave 13 year old girls is in a prominent place in their home, reminding them of her bravery and love for her grandmother. Katavathadu has not allowed her pain to ruin her life. My friend tells me it is her house that everyone in the village likes to come to. It is where strangers and visitors enjoy coming too. He then commented, "You can see, can't you, that it is the prettiest house in the village?" (Next post about the village, and more pictures of Katavathadu's house). Some beautifully painted stairs, going up to a rooftop or balcony, where it is like another room in the house. The rooftop is where people gather and sleep in the warm weather under the skies.Plants, fruit trees are everywhere. Katavathadu had made her home into a haven, a place of beauty for all to come. In her anguish, she decided to reach out, embrace, instead of caving to sorrow. A remarkable trait of people who experience tragedy is to welcome people into their lives and heart--even when their own hearts hurt. Katavathadu in the background, with some passion fruit she had just picked for us. This is a picture of the Best picnic of my life (blog about Normandy). Here is Bernard, now 85 and Collette Marie, about 78, who live in Normandy, France. Bernard was a 13 year old boy when the Americans came to the Normandy shoreline in 1944. He befriended them, and never forgot the gum and friendship they gave him. His wife, Collette, still lives in a home that is about 300 years old. Bernard has been a farmer all his life. They have the most beautiful apple orchards you have ever seen. You can still see the bullit holes on the outside of the house. I started crying when we left the picnic because he picked up his son in the wheelchair next to him with his strong hands to put him into the car. I didn't know a 84 year old man could do that for his beloved son. But he does, every day. He cuts his food. They laugh at jokes. With my minimal French, these people forever etched their influence on my heart. I visited in their home for about five days, and was a better person when I passed through the gate to go back home. Here we are at the picnic in Le Tronquay to celebrate Le Fete des Voisins and to honor my father-in-law who helped to liberate this small village. Mitch Quilles, a videographer of WW2 stories, Jean-Francois Marie, my son, and the Maries. Jean-Francoise was also a remarkable hero to me. His elementary English went a long way to communicate with his loving heart. When we left the last day, he rolled himself in his wheelchair to the gate. As I looked in my rear view mirror in the long driveway as I drove away, I could see him sitting there, waving to us. I didn't want to leave. These were my people, and I hardly speak French. Since I have a son with a disability, I am touched when parents, even in their 80's are caring for their children. Successful people accept the conditions, and love anyways. Peter, my son, Mitch, and Bernard in Camont, France, another village where my father-in-law helped to liberate. Remarkable people who have faced tragedies (and if you live long enough, we all do), reach out, embrace, teach, love. They deliberately block the sadnesses and sorrow of their own lives to elevate others.